Frank Tracy (1864-1932) was the son of an Irish immigrant, Patrick Tracy (1839-1912). In 1870 Patrick Tracy was a shoemaker and lived in Chauncey, Tippecanoe County, Indiana. His son, Frank, was recorded in the U. S. Census of that year as James F. Tracy, age 6, born in Massachusetts. Ten years later, in 1880, the Tracys still lived in Chauncey, Indiana. J. F. (Frank) was 16 years old, and his two younger brothers, John P. and George H., were 12 and 1 respectively. In the 1887 city directory for Lafayette, Indiana, Patrick Tracy was identified as a janitor at Purdue University in that city. Frank and John P. Tracy were also listed as living in nearby Chauncey. John P. was a "car builder, car works." The firm, Tracy Bros., Elevators, appeared in New York city directories in 1906. They were located at 65 Dey St., and the brothers were Frank Tracy and his brother, John P. Tracy (1867-1915). 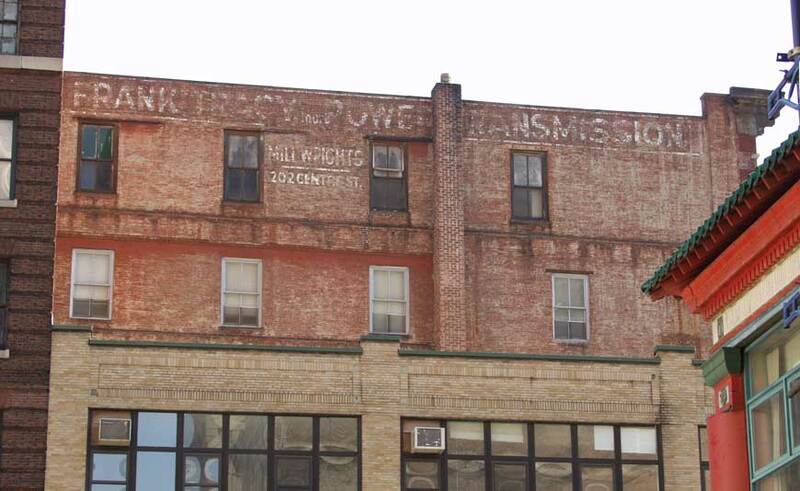 Subsequently, Tracy Bros. were machinists and millwrights located at 185 Washington St. from 1907 to 1918. Frank Tracy, millwright, appeared at 202 Centre St. in 1913. On John Tracy's death in 1915, George Hamilton Tracy (1877-1939) became the second brother at Tracy Bros. George Tracy continued in elevator construction and repair in New York until at least the mid-1920s. Webster, 1913, defines a millwright as a "mechanic whose occupation is to build mills, or to set up their machinery." It is unlikely that Frank Tracy built mills in New York City, but he may very well have built machinery to be used in milling and other heavy machinery used for grinding and other factory procedures. The power transmission appliances referred to in the ad above (from 1918) probably consisted of machinery with gears used to transfer power from one level to another. Frank Tracy Inc. was in business at 202 Centre St. from 1913 to 1984. In 1971 the company became a division of the Bearings Industry Corp. They moved in 1984 to 44 Wooster St. and then again in 1997 to 309 Morgan Ave., Brooklyn. They are currently (2013) still in business on Morgan Ave., Brooklyn, as Frank Tracy Division Bearings North Side Power Transmission Corp. 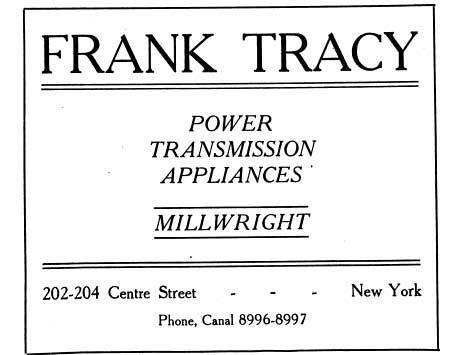 In 2005 switchboard.com described the business of Frank Trace Inc., 309 Morgan Ave., Brooklyn, as "Power Transmission Equipment, Materials Handling & Heavy Machinery, Pulleys & Sheaves; Bearings, Industrial Machinery & Equipment, Industrial Supplies." Another important figure at Frank Tracy Inc. was Henry A. Stuhrmann (1888-1951). Stuhrmann was a manager and vice-president at Frank Tracy and became president in 1932. The following appeared in the New York Times, 5 Jan. 1951, "Henry A. Stuhrmann, president of Frank Tracy, Inc., distributors of mechanical-power-transmission equipment, died of a heart attack yesterday shortly after entering St. Mary's Hospital in Hoboken, N. J. His age was 62. Stricken in his office at 202 Centre Street, this city, Mr. Stuhrmann was rushed by ambulence to the Hoboken hospital. He had been with the downtown machinery firm for the last forty years, serving as president since 1932. Mr. Stuhrmann resided at 206 Eleventh Street, in his native Hoboken. His widow, Emily A. Stuhrmann; a son, Herbert F., and a sister, Henrietta Horn, survive."